Some parents are saying hooray! as their kids are going back to school and then there are some who are emotional wrecks and nervous as hell, as their kids are starting school for the first time. 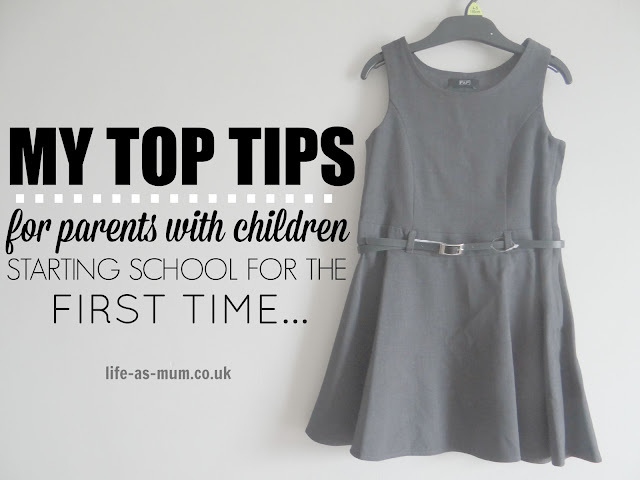 If you are a parent with a child starting school for the first time.. then congratulations! Welcome to the world of stress, very early morning and homework evenings. I remember when Mia started school for the first time. I felt I had somehow achieved a goal. Not quite sure how, but I was so proud seeing my first born wearing her school uniform for the first time. Now my youngest daughter is wearing a school uniform, starting big school for the first time. Seems pretty unreal. I am now a mother of two school children. Nuts right? 1. Prepare - Totally agree with anyone who says, prepare the school day, the day before. It really does help. Lay out your child's school uniform ready for the morning, and if they have packed lunch, do it the night before. Less stress for you all in the mornings. It may even be a good idea to get your outfit out ready for the morning too. 2. Get involved - Try and involve yourself with as many things that the school does. You will have letters through out the year updating you about the things they do. Try and support the school by attending to any fairs, stalls or anything else they do. Talk about school with your child. Get involved with their homework, make time. 3. Encourage - Try to encourage your child to go to school. When you pick them up from school, ask them how their day has been. Try and make the whole walk/drive back home about their day at school. 4. Home - Maybe not in the first year of school, but in the second year, your child may start getting homework from school. Even though they have had school all day, and then homework to do at home, still try and learn them things at home too and try and improve them for school. There are many books in shops that can help you and your child. 5. Communicate - If you feel you want to have a chat about your child, don't feel shy, just go up to the teacher before or after school. You could even phone the school and make an appointment sometime after school. Also, on school yard, try and communicate with the parents too. After all, your children are going to the same school. 6. Wake up early - School can be a long day for a child. Usually it is a 9am start and 3pm finish. Most parents need to be out of the house with their children by 8.30am to arrive at school on time. Put your alarm on, if your children don't wake up early enough, make sure you have plenty enough time to get ready. 7. Show interest - Just like getting involved. Show interest in your childs school, even from home. Show that you are interested in what they have done all day. Show them that you are interested when they show you their work or sing you something that they have sung in school. 8. Be patient and strong - Some children can scream blue murder, get very emotional or throw a massive tantrum when starting school. I am lucky I haven't been through this with my two girls. I did go through it with a child at my old job. The teacher will help and will eventually calm your child down so try not to spoil your child by taking them back home or going into the classroom. You are then showing them that it is acceptable and they will more than likely do this often. Try and drop them off, re assure them that you will be picking them up later on, to enjoy their day, tell them you love them then just walk away. As hard as it sounds, it will work in the end and you will be thanking yourself. 9. Routine - I find a routine very important when starting school. A full night sleep and a full tummy going to school. Not having a routine can mess your child's sleep and maybe turning up late to school most morning. A routine is always good for a child, and for you. 10. LABEL! - Label all your childrens clothing, including shoes! Have you got any tips? This is a really good post for parents of children starting school for the first time my child is 15 months but I have a step daughter who is 9 now. My husband takes her to school every tuesday morning as we have her monday nights and every other weekend, her school is a 30min drive away from us so being organised is a must especially on those days where she is dragging her bum to get ready. I also noticed that she never remember's what she has done at school so asking questions to help them remember is really useful. Great tips - R is at pre-school but for 3 days of the week it's 9-3pm so pretty much school. I've joined the committee. Get me! I totally agree about mornings - R has recently been sleeping in until 8am and it's putting a strain on getting there in time, so I'm going to have to set my alarm and wake him up a bit earlier, I think!